Teagan Furbish had a hat-trick in leading the No. 8 ranked Chamblee Lady Bulldogs to a 6-0 Class 5A girls first round state playoff victory over the North Springs Spartans on Tuesday at North DeKalb Stadium. Furbish scored in the first 10 minutes of the game to give Chamblee (13-3-2) the only goal it would need as the Lady Bulldogs defense allowed just one early shot on goal. Savannah Lawrence would score about three minutes later to make it 2-0 and Chamblee would take that lead into the half. Paris Williams had a big start to the second half with two goals and an assist. The first came as she got out in front of the defense on a run away with 32:11 and put the shot past the Spartans goalie to make it 3-0. The second goal came less than a minute later as Williams again got out in front for a one-on-one with the tender to make it 4-0. The Chamblee senior got her assist as she found Furbish crossing in front of the goal with 24:56 to play for the score and a 5-0 advantage. Furbish came back with 18:26 to play to set up from 30 yards out and blasted one high over the goalie and under the crossbar to make the final margin of 6-0. Chamblee faces the winner of tomorrow’s Rome (9-7-2) and Johnson-Gainesville (10-6-1) match at North DeKalb Stadium next Tuesday. In other Class 5A girls’ action, No. 7 ranked Riverwood (13-5-0) knocked out Arabia Mountain (9-6-2) 10-0 and No. 2 ranked Decatur (16-2-1) defeated Southwest DeKalb (12-6-1) 9-0. In Class 5A boys’ play, Riverwood (10-7-2) ended Chamblee’s season by winning a tough 1-0 decision over the Bulldogs (5-10-1) at Riverwood. 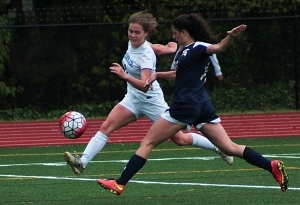 The Dunwoody Lady Wildcats (9-7-2) pulled off a road upset of No. 8 Apalachee with a 2-1 victory on Tuesday night. Dunwoody advances to the Sweet 16 for the fourth time in program history and will take on Region 6 No. 1 seed Creekview (14-3-0) which defeated South Paulding 11-1. The Lakeside Lady Vikings (10-5-2) lost a tough battle to Rockdale County (16-3-0) 5-4 in penalty kicks after going through overtime tied 1-1. There are six DeKalb teams on tap in first round state playoff action on Wednesday including a Cross Keys doubleheader at Adams Stadium. The Lady Indians host No. 9 ranked Grady (10-4-1) to open the doubleheader at 5:30 pm while the No. 1 ranked Cross Keys Indians (15-1-0) also entertain Grady (8-4-2) following the girls’ game. In other Class 5A boys’ play featuring DeKalb teams, No. 6 Clarkston (16-3-1) hosts North Springs (11-3-2) at Hallford with game time set for 6:00 pm. Arabia Mountain (11-7-0) travels to No. 2 ranked Decatur (15-1-2) at 6:00 pm. The Tucker Tigers (9-7-2) go on the road to Heritage (15-4-1) for a Class 6A boys’ state playoff first round match. Redan (8-5-1) travels to Bremen (12-0-4) for a 5:30 pm Class 3A girls’ match.